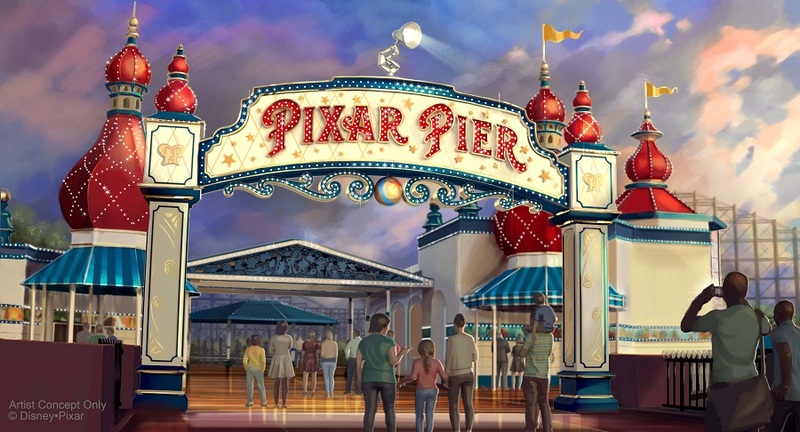 Anaheim, Calif. (Feb. 11, 2018) – Disneyland Resort will open the highly anticipated Pixar Pier at Disney California Adventure Park on June 23, 2018, powering up summer with more of the playful Pixar stories and characters that guests have come to know and love. Also debuting in June, a new float adds superhero fun to the electrifying “Paint the Night” parade, featuring characters from Disney•Pixar’s “The Incredibles.” The news was announced today by Walt Disney Parks and Resorts Chairman Bob Chapek during his presentation at D23 Expo Japan at Tokyo Disney Resort. The fan-favorite “Paint the Night” parade returns April 13 for Pixar Fest, this time at Disney California Adventure. And in June, the popular nighttime spectacular adds even more Pixar fun with the addition of a new, high-energy float inspired by “The Incredibles.” Mr. Incredible, Elastigirl and Frozone will showcase their superhero awesomeness as they take on their newest threat, the Underminer. Violet, Dash and Jack-Jack also showcase their unique powers in surprising new ways, as shown through dynamic and innovative visual technology. 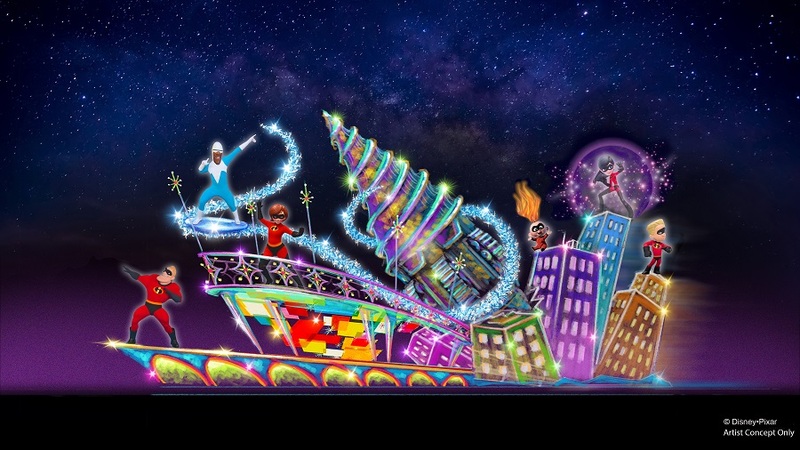 Like the other elements in this spectacular parade, this new float will come to life through a series of dazzling LED lights, new music elements and high-tech, pop-art effects inspired by the mid-centurymodern style of the films. And appearing for the first time at Disney California Adventure, the “Paint the Night” parade will return to delight guests with the parade’s 1.5 million, brilliant LED lights and catchy tunes. In addition to the new Incredibles-themed float, “Paint the Night” parade will spotlight many Pixar stories and include characters from “Toy Story,” “Monsters, Inc.” and “Cars.” A new film festival, Pixar Shorts, will also take place throughout much of Pixar Fest at Disney California Adventure. Pixar Shorts will feature rotating favorites including “For the Birds” and “LAVA” at the Sunset Showcase Theater in Hollywood Land. The Disneyland Resort features two spectacular theme parks – Disneyland (the original Disney theme park) and Disney California Adventure Park – plus three hotels and the Downtown Disney District, comprising unique dining, entertainment and shopping experiences. The Resort’s hotels are the luxurious, 948-room Disney’s Grand Californian Hotel & Spa, which also features 50 two-bedroom equivalent Disney Vacation Club. units; the magical, 973-room Disneyland Hotel – both AAA Four Diamond properties – and the 481-room Disney’s Paradise Pier Hotel with its “day-at-the-beach” theme. For information on attractions and vacations at the Disneyland Resort, visit Disneyland.com, call (866) 43-DISNEY or contact local travel agents. Located in Anaheim, Calif., the Disneyland Resort opened July 17, 1955. Open daily, year-round. Pixar Animation Studios, a wholly owned subsidiary of The Walt Disney Company, is an Academy Award®- winning film studio with world renowned technical, creative and production capabilities in the art of computer animation. The Northern California studio has created some of the most successful and beloved animated films of all time, including “Toy Story,” “Monsters, Inc.,” “Cars,” “The Incredibles,” “Ratatouille,” “WALL•E,” “Up,” “Toy Story 3,” “Brave,” “Inside Out,” and “Coco.” Its movies have won 32 Academy Awards® and have grossed more than $11 billion at the worldwide box office to date. “Incredibles 2,” Pixar’s 20th feature, opens in theaters on June 15, 2018.